Presenting the opinions of your expert at trial is often the most stressful task at trial. Experts are, by their very definition, people who know way more about a subject than pretty much anyone else, and this fact often makes it particularly difficult for them to make their testimony understandable to those who know nothing about the subject. For this reason, thinking about how to show your expert’s opinion, rather than relying upon them to tell their opinion, might be one of the most important things you can do to prepare them for deposition and/or trial. When developing your case, you take your expert’s views and opinions into consideration at every turn, but thinking about how best to show those opinions is also very important. The expert might have the capacity to make visuals or a PowerPoint themselves, or they may need support and assistance. This process can get even more complicated when both you and your expert must weigh in on the design process of your exhibits and graphics. This article will address some of the ways that you can make the process easier, more efficient and end with a better result. A recent case provides an overview of the graphics process and a good number of lessons to be learned. The case involved a claim of non-compliance, regarding state regulations for gas stations involving their pump equipment. 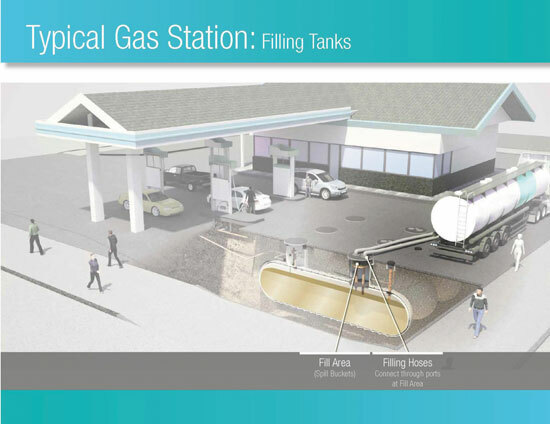 While every one of us knows something about gas stations, almost no one has any idea of how that gas ends up in their tank, or how the pumps are supposed to automatically shut off in the case of leaks. Given the highly technical nature of this complex underground system, having the expert simply talk about how the system works at trial would be a nightmare for counsel, judge and jury. Rather, this case cried out for easily understood graphics. However, the question always is: how do you get there? This case scenario obviously involves the inner workings of a highly sophisticated and nuanced technical system, and it must ultimately make sense to a jury. The most important factor for the attorney to realize is that the learning curve they might well have gone through to pick up the nuance of the equipment, will also be felt just as strongly, if not more strongly, by someone tasked with creating graphics to show your expert’s opinions. An attorney often works on a case for years, so expect it will take time to get a graphics team up to speed. It is one thing to generally understand a complex issue, but when creating a graphic of complex equipment, all aspects must be accurately visualized, and every single detail must be shown. A graphics team needs as much information as possible to re-create the equipment or scene. For this reason, obtaining all documents from opposing counsel early in litigation is often crucial to creating good graphics. Even if the documents do not specifically relate to the issue you are interested in, they may be absolutely necessary in showing the whole system, machinery, plant or scene. Always consider asking or obtaining everything related to the physical makeup of a location in the issue rather than just narrowing the focus of your issue. Anytime you can get blueprints of a building or details of equipment — do it! Such documents can be produced electronically, so even large piles of drawing details can be reduced digitally to mere megabits, in place of rolls and rolls of giant documents. Experts are able to give detailed specifications: exact measurements, acute understanding of the systems, why certain violations occurred, and differences in specific pieces of equipment; yet without diagrams, maps, or photos of all aspects, it may be hard for a graphics team to re-create everything you need for good expert visuals. When involving a graphics team to assist in the preparation of expert work, considering how to involve that graphics team is paramount — in light of the fact that everything an expert touches, sees or hears is discoverable information. For obvious reasons, having a graphics team simply email draft after draft of concepts, with detailed questions and concerns to the expert, is generally a really bad idea. Back in the day, communications with experts were likely done in-person and over the phone. If you needed a face-to-face meeting, and your expert(s) were not local, you’d be racking up miles for the sheer purpose of developing case theory in-person. Thanks to the technological advances — in well, just about everything! — your face-to-face can occur anytime/anywhere, and this really helps the interactive process between an expert and your graphics team. In this sample case, the graphics team spent hours with the expert without ever sitting in the same room. Using an online service that allows for screen sharing is a great way to start the process of downloading all the expert’s information to those tasked with showing that information. This is a viable option for frequent communications — plus, it is free to use with no electronic trail of documents, revisions or emails. The creative process normally starts by understanding and developing the lawyer’s concepts of the key issues and what needs to be shown. However, the expert is the one person that is going to sit on the stand and give the opinion that will likely be grilled by opposing counsel if any content of the visual is not correct. For this reason, experts tend to be extremely careful in reviewing any image they will be presenting, and this fact must be taken into account in the extent of preparation and estimating the time necessary. The more complex a concept, the more revisions and time you should expect you will need for your expert and graphics team. Ultimately you want your expert to be comfortable with the final visualizations rendered, as well as to confirm that such depictions are in line with his or her opinions. 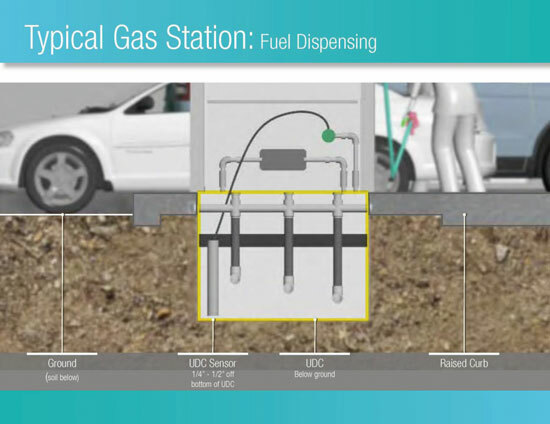 In this case, visualizing several key concepts was obviously crucial: how the fuel is transferred from delivery trucks to the underground storage tanks, how fuel is then dispensed into vehicles, and how sensors trigger properly in order to correctly detect leaks. 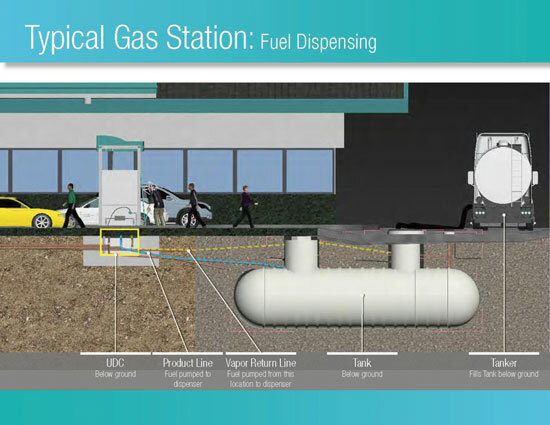 The system functions within this case scenario were small and invisible to everyone, especially because the most important components at issue were placed or inducted into the ground beneath the gas stations. For this reason, with such cases that involve environments that are difficult to analyze/photograph, if only images lacking context are available to describe how a system functions, this can often lead to confusing notions and add little value for to those trying to understand such systems. When this process was first initiated, the graphics team had limited views as to placement and function of the system components. They relied heavily on schematics, plans, and the expert’s own anecdotes as to how the tanks “likely” function once they are resting underground. Bear in mind, these systems can vary greatly between locations depending on soil conditions, installation specifications, preferences of brands/models utilized, etc. The graphics team’s job was to create a generic representation to show how the system works (See Figures 1 and 2). Pretty much everyone has some understanding of what happens at a gas station: You pull up to the pump, insert your credit card, push some buttons, and select your grade of fuel. 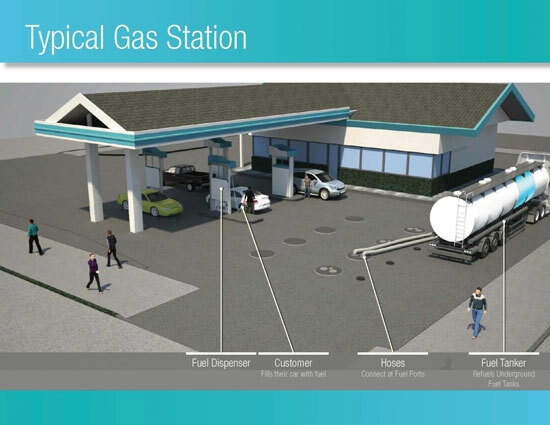 Once you insert the fuel dispenser/nozzle into your car, fuel is then transferred from the underground tank, through the pump, and into your vehicle. The process was graphically modeled in such a way that the lawyers could demonstrate how this integrates with your average consumer on a routine basis, by creating a “cut-away” view of this process. The graphics showed exactly what is supposed to happen once the consumer initiates the transaction. This presented a behind-the-scenes look into what would otherwise be completely invisible, showing the entire process piece by piece. 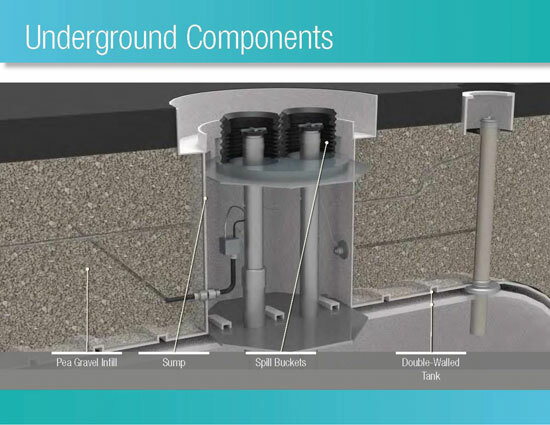 The graphics team set out to replicate the underground systems and storage containers that were out of view in such a way that a layperson can understand them (See Figure 3). The sensors themselves commanded a significant amount of technical explanation. Two model sensors were at issue, even though the sensors did roughly the same thing — measure height of fluid, provide risk protection by sensing prior to overflow (See Figure 4). Each sensor is designed to detect leaks or spills that can occur when fuel is transferred from trucks to the underground system. (See Figure 5.) They also read rain water runoff that may collect in the bucket, housing the sensor. This specific read of rain water is problematic because it can create a false-positive and sounds an alert due to a liquid other than gasoline. Once the attorney was comfortable with the graphics team’s understanding of what he wanted produced, the graphics team could contact the expert directly for more details as needed. Since this was always a collaborative process, both the lawyer and the expert had a good sense for how the designs were taking shape. What is said, is not always understood. What is shown has a much better chance of comprehension. That is reason enough to use graphics to help the jury understand your expert’s concepts and case opinions. Start thinking early about the use of graphics by your expert. Provide all the necessary documents to your graphics team. Give them sufficient time to work with your expert. These steps will enhance your ability to show the jury images that are complete, accurate, instructive and understandable. Morgan C. Smith is an attorney who was a partner in The Arns Law Firm, San Francisco, for 15 years, specializing in personal injury and wrongful death cases. 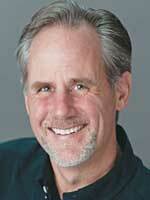 Morgan now owns and manages Cogent Legal (cogentlegal.com), the Oakland-based litigation graphics and trial technology firm he founded to provide visual support for any kind of case. Audrey Murray is Marketing Director and a litigation consultant at Cogent Legal. She has 17 plus years’ experience as a paralegal, predominantly in personal injury and landlord/tenant law. 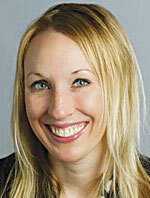 She works directly with lawyers and their staff consulting on graphics, exhibits, and strategy. Her goal is to help bring concepts to life visually.